It’s always best to keep your vehicle in top condition, nobody wants to be let down by problems when they are away. At Alexander Caravans Services, we understand that customers want a straight forward servicing at a reasonable price, whilst being able to talk to the actual person that will be carrying out the work. We always keep our customers informed of any problems and discuss any repair work required before commencing, so there will be no nasty surprises on collection. We will meet on arrival and help you to unhitch, making your drop-off time hassle free. All makes and ages of caravans, also fit replacement panels and damp repairs. Habitation service for all motorhome / horseboxes, also source parts and furniture/appliances for conversions. 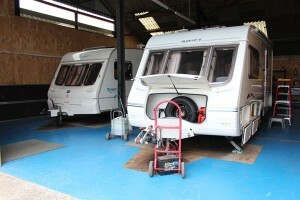 Servicing and safety checks to all types of trailers and trailer tents. Authorised warranty repairs for most appliances e.g. Truma, Thetford, Whale etc..
All extras supplied and fitted i.e. extra sockets, CD radio, top boxes / bike racks, awning rails etc. Motor movers supplied and fitted also transfer existing mover to new caravan. All insurance work carried out, written estimates available. Please call us today on 01606 883613 or email us at info@alexandercaravanservices.co.uk for more information or to book your next service.